Background: Loner by day, boxer by night, Rocky Balboa is good man stuck in a strong guy's body. He may fight with his fists in the ring, but he has people's thoughts in his heart at all times. Consider when Rocky made sure a customer of a pet shop paid his bill in full, consider a scene when Rocky walked a poor girl home who was being bothered by creeps. 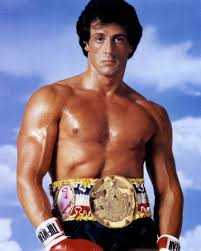 Rocky is that symbol of good wrapped up in brawn.